1. Introduction, design, features and specs. As the BYOD (aka "bring your own device") movement gains more traction than ever, people are expecting more portable, multi-purpose and even stylish devices. Lenovo, the de facto leader in the business hardware world with IBM's ThinkPad brand in hand, has been paying close attention. 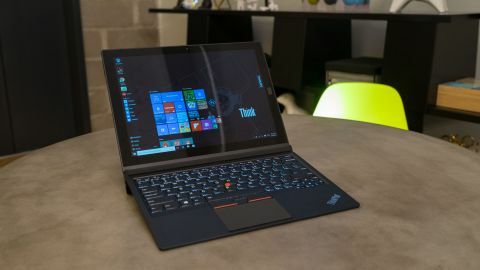 It's latest attempt to appease the iPad-hungry audience is the Lenovo ThinkPad X1 Tablet, arguably its most adaptable computing device yet. Complete with hot-swappable modules, a built-in fingerprint sensor for Windows Hello and ThinkPad's signature slick but understated design, is this the work-ready tablet to rule them all? It's a bit more complicated than that. Lenovo clearly crafted the ThinkPad X1 Tablet with versatility in mind, drawing inspiration from unique ideas of its own (e.g. a projector module similar to that of the Yoga Tablet 2 Pro) while cribbing – and improving upon – at least one from the market-leading Surface Pro 4 (e.g. the magnetized keyboard cover for multiple typing angles). Like so many of its products, Lenovo's new modular business hybrid comes coated in a black, soft touch paint that looks slick and understated, a hallmark of the brand that is never lost on Lenovo. If you're trying to give off a professional but tech-savvy vibe, this tablet's profile will serve you well. However, we have one major pain point with the ThinkPad X1 Tablet design: the kickstand. Rather than opening out and upward, like the Surface Pro 4, this tablet's hinge opens out and downward, so that the base of the kickstand rests on your lap, not the edge of it like with Microsoft's solution. Because this arrangement doesn't offer much resistance beyond its sturdy hinge, it's far easier for this tablet to slide off of your lap than it is for Microsoft's. That's because the latter uses the friction created by the lip of its kickstand to keep it steady. While a bit of a pain, and definitely a matter that should be accounted for in considering whether to pick one of these up, the reasoning for the design makes sense. The various connections and controllers for the tablet's available modules likely need that space that would otherwise be thinned out for a hinge that flips upward. But, was that a worthy trade off? Well, that's tough to say with 100% certainty, as we've yet to use Lenovo's Presenter module outside of a press briefing. But, the fact that the Productivity Module boosts battery life by nearly two hours in our tests speaks pretty well as to whether it's worth a bit less stability on your lap. And that's before you even consider the additional ports it offers: one more USB 3.0, HDMI and Lenovo's OneLink port. Not a bad trade-off at all. That said, it's the $150 (about £116, AU$197) price tag that will hurt more than a bit of a slippery grip on your legs. The Presenter Module, while we haven't been able to test it out in any detail since CES, throws an 854 x 480-pixel image up to 60 inches wide from 200cm (about 6.5 feet) away. The module operates fanlessly and adds up to 2 hours of juice to the tablet's battery. Finally, its HDMI port can accept both incoming and outgoing connections. However, at $300 (about £226, AU$394), the Presenter Module is rather prohibitively priced. Granted, IT fleets might only carry a few of these for employees to share, but for the individual at a startup that might be looking at this versus a legit, full HD projector for about the same price, it becomes harder to justify. Regardless, with modularity sweeping the tech scene right now, we hope that Lenovo continues exploring and – more importantly – refining these ideas, because something tells me this trend isn't going to fade anytime soon. The configuration you see above goes for around $1,600 (about £1,199, AU$2,096), with the starting setup poised to run you about $1,100 (around £830, AU$1,440) – both of which come with the ThinkPad Keyboard cover. The entry-level spec halves both the available memory and storage space while bringing the dual-core processor down 100MHz in frequency. Without the keyboard cover, which we'd say is all but essential, the ThinkPad Tablet X1 starts at $899 (about £679, AU$1,199)?. That's a bit pricier altogether than Microsoft's latest Surface Pro 4 device, but it's hardly an apples-to-apples comparison. Speaking of the keyboard, expect to find nothing less than Lenovo's stalwart typing pedigree on display. This is all but a traditional Lenovo AccuType keyboard, with a firm keyboard deck and the satisfying kickback you've come to love plus the traditional, accurate and smooth TrackPoint inputs. Of course, the whole set of keys is brightly and uniformly backlit. But, the stars of the show are the two magnets through which the keyboard attaches to the tablet or any module that's attached to its base. Taking the concept one step further than the Surface Pro 4, these offer not one, but two additional angles from which to type. Then again, we find ourselves using the "default" that's at about a 35-degree angle than the new one that's about 50 degrees – it's simply too elevated. At any rate, this is one of the most comfortable keyboard covers we've ever typed with, so kudos to Lenovo on that. Current page: Introduction, design, features and specs.